This book was a great way to end the Rock Kiss series. It was a heartfelt journey that ended on a positive note. 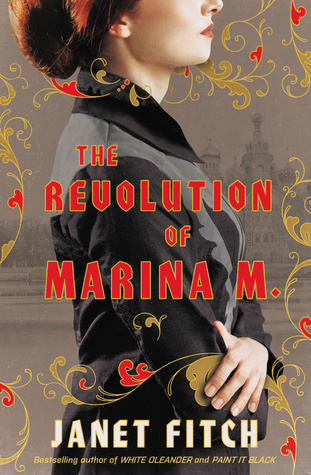 It was very steamy and romantic read which made it easy to see the strong connection between Sarah and Abe. 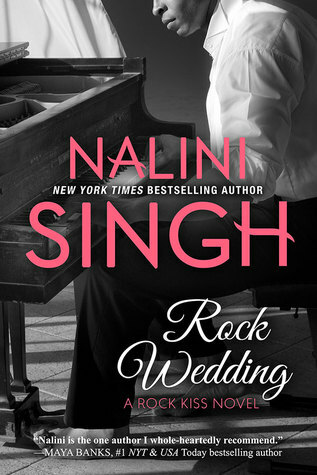 Rock Wedding touched upon dark or sad matters which were very similar in style to Rock Redemption. That does not mean that they talk about the same things. They tackled different issues, but both very important and hard to write about. Death is something hard to talk about in such a way that conveys emotion but doesn't over due and Nalini Singh does a great job with this. Both characters, Sarah and Abe were captivating with their shared and personal story. They made you rally behind their love story and took you on their emotional roller coaster. And what a ride it was! There was so many jaw-dropping, tear-jerking, heart-wrenching and adorable moments. They were like separate puzzle pieces that fit together to create this story. Sarah, like the earlier heroines, has been through so much. She has run into so many obstacles that would break the average person, yet she came through. Sarah started her own company, took control of her own life and found her self-confidence. Her story is inspiring in the way that life didn't break her and she was still human. She still makes mistakes and has flaws. Sarah reminds me a lot of Jane Eyre. They are from two different worlds but they both cam from bad childhoods. They fought for a marriage that they earned and by growing up found their self-identity. I loved that we got to see Sarah develop in stages. We see her as an insecure young woman and the journey that makes her into a self-confidant woman. Pairing back up with Abe doesn't seem so smart in the beginning of the novel because of their bad history. He was an addict to drugs and alcohol to the point that he could have killed himself. He is now a recovering addict but still has many problems that he is going through. In the previous books we see the band members refer back to his addiction and anger, but in Rock Wedding we get to see the real effects on Abe. We see his struggles as a recovering addict and dealing with the emotional consequences of his past. The characterization was incredible. Enough detail that we felt is struggle, why he became an addict and, best of all, why he stopped. "That demon whispers to me from time to time...But no mater what, I've never, not once, felt tempted to give in. You know why?...because I know the second I touch drugs, I lose you and I lose the right to be a parent to our child. You wouldn't even have to throw me out. I do not want an active drug use raising our child--so the second I do drugs or take a drink, I give up the woman I love and I give up our child. That's not choosing to happen." Like Sarah's journey, it is filled with many obstacles and something that will continue past this book. The biggest thing improvement is Abe's cowardice. Abe didn't physically attack a living thing but he did a lot of emotional and mental damage to others. He did this out of his fear of losing someone he loved. Because of that I would call him a coward unlike Sarah. She is more on the wary side. The change from cowardice to a more self-confidant man was wonderful to see. Just like Sarah's journey, it is also inspiring. Not because it a recovering addiction story but because of the realism of his life. His story did not end in flower and bows but with hope for a better future. That is why their second chance at love works and seems real. Their love story was great and another great thing about this book is how it talks about death. Death is a big part of the book as both the main characters have dealt with it. Just like the average person they grieve and Ms. Singh does this in a realistic way. They don't overreact every time the person comes up nor do they get up and forget about those who passed away. They are real people and they move on but they don't let go. That was the greatest thing about this book. The fact that emotion could be conveyed to the reader but not suffocating them with overly descriptive or emotional words. The one problem that I had was the constant referring to the past. What I mean by what is that for most of the book we see Abe repeatedly saying that he wronged her and she could never love him. Sarah would say that she shouldn't forgive him and how she loves him. I get this is a big part of romance and I can overlook it most of time. But it was referenced many, many times and it did get a bit irritating. It did not detract from reading the book, but was just there in the back of me head. The side characters were great! We revisit all the previous couples and their happy endings. The epilogue was a gorgeous way to finish the series! It is a great way to finish this series and then start the new one with Gabriel's brothers. I won't talk anymore because there are spoilers since it’s something to read for yourself. Overall, this book is a five star reading! Overall, this book is a five star reading! This is a spectacular book and I would recommend this book everyone especially if you have read the previous books in Rock Kiss. Thank you so much for Netgalley for providing an ARC in exchange for an honest review!